Located in the old Pittsboro Post Office, we are the only casual full service seafood restaurant in downtown Pittsboro. We are committed to serving fresh and seasonal fish and shellfish harvested by fisherman from Virginia to the Carolinas. Our food is prepared and presented in an atmosphere where friends feel comfortable and relaxed to either linger over drinks and a dozen oysters at the bar or sit and enjoy a piece of fresh fish cooked on our wood grill. We set ourselves apart from all other seafood restaurants with our commitment to personally travel twice weekly to select and procure the very best fish & shellfish from South Atlantic fishermen, who we have cultivated relationships with over the years. We feel, that when it comes to the selection of fish and shellfish, we trust no one else to select these items but ourselves. In this way, we know we are able to deliver the very best to our Friends every night! 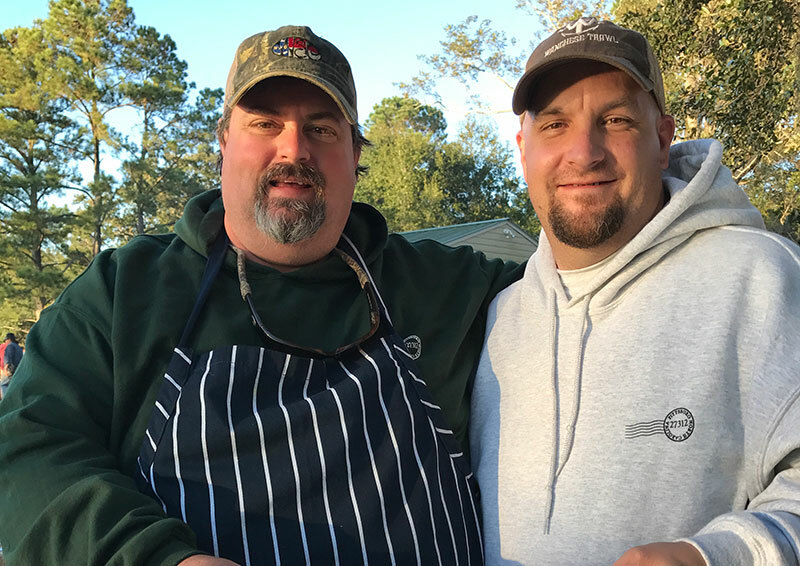 Born in Wilmington, NC and raised in the pluff mud & river swamps of the Carolinas, James Clark embodies the outdoors which has fueled his passion for catching and cooking fish. Chef Clark specializes in sustainable foods and under-utilized fish “Please don’t call it Trash Fish”. His individual style is inspired by local, Southern influences infused with his love for the outdoors and his passion for everything that swims! Chef Clark is a graduate of the New England Culinary Institute in Vermont and has been featured in the Associated Press across America on Utilizing Under Utilized Fish, The Sun News, Washington Flyer, Washingtonian, News and Observer, Grand Strand Magazine, The Local Palate, AAA Magazine. Born in Westwood, NJ and raised north of the Mason Dixon Line, Bill Hartley has always had a southern soul. Growing up in Northern Jersey and working on a local farm as a young boy, inspired his love for fresh and local ingredients. Eight years ago Bill had the opportunity to work alongside James Clark at the Marina Inn @ Grande Dunes, Myrtle Beach. While there, Bill learned from James and was introduced to the people who brought these ingredients to their doors. Bill then joined Chef Clark in Chapel Hill to continue the “sustainable and everything local” message. Bill happily calls James his mentor, friend and now business partner. Chef Hartley is a graduate of the Culinary Institute of America and most recently served as the Executive Sous Chef at The Carolina Inn. Pittsboro has a true small town feel with a charming Main Street which is centered by a recently rebuilt Court House. The shops in the center of town include a bakery, antique stores, ladies boutique dress shops, law firms and a classic Soda Shop.